As always, this oil-free recipe is 200 calories. This one also happens to be a vegetarian dish. 2. 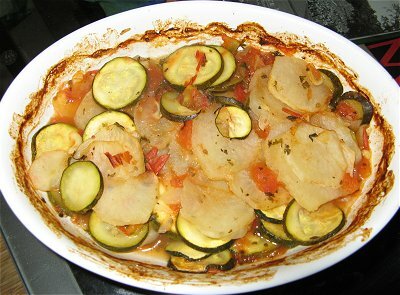 Wash, then cut the tuber and zucchini in thin oval slices. Preheat the oven at 400F (200C). 3. Add 1.5 cup of water (even better: bone broth) along the rest of the ingredients in a baking dish. 4. Bake until most of the water is evaporated, the sauce is thickened and the veggies are cooked through. Serve hot.